Constable Jim Gibbs spent much of Saturday driving the hilly back roads in a 4 wheel drive vehicle to the homes of people that he thought might need assistance getting out or in need of food. Most of the folks that he found trapped in their homes were willing to just wait out the weather and all seem to have enough food. While the roads were drivable, the large amounts of mounded slush made driving in the proper lane difficult and a hazard on hills, especially at the hillcrest. Those with 2 wheel drive vehicles found it difficult to get up driveways on hillsides. Jerry and Faye Barrett, on Burt-Burgen Road lost their carport to the weight of the snow and ice. The carport apparently collapsed sometime Friday evening falling on a vehicle parked under it. Sunday morning brought a change for the worse on the roads as the slush turned to ice making some roads impassable for 2 wheel drive vehicles. 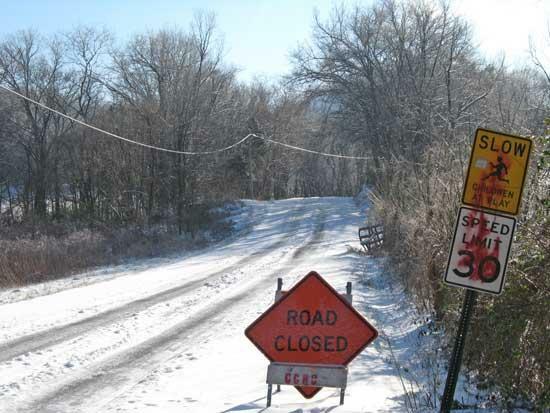 Many of the hilly roads leading up to the plateau had been closed by the Cannon County Highway Department. Gibbs asked that if you know of anyone in the hilly area of District 1 that may need their welfare checked, to call him at 765-7470 and he will check on them. If you think that their needs might be of emergency nature to call the 911 center for the proper response. He suggested that anyone traveling the hilly back roads use extreme caution and to avoid completely the hills lead up to the plateau.